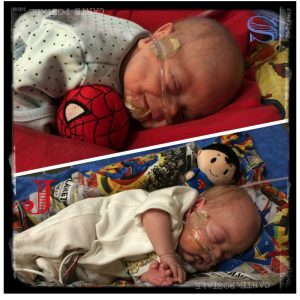 In our September edition of our Preemie Family newsletter we learned about 24-week, 3 day preemies Samuel and Jacob. Samuel was born at 1 lb 6 oz. and spent 143 days in the NICU before being discharged to home, Jacob was born at 1 lb 14 oz. and spent 123 days in the NICU before being discharged to home. Read more in an update by their mother Jeanette Lundgren. 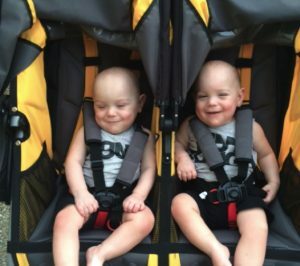 Samuel and Jacob were born at 24 weeks via emergency C-section due to cord prolapse following PPROM at 21 weeks. They had a complicated NICU stay including bilateral pulmonary hemorrhage, BPD, renal failure, fungal sepsis, pneumonia, and Stage 3 ROP requiring 2 rounds of laser surgery for both boys. They showed a remarkable amount of strength and determination as they overcame each setback. We were overjoyed to bring them home to meet their four siblings after over 4 months in the NICU. Samuel came home on oxygen and a monitor, and required home oxygen for 9 months. Jacob came home without any oxygen, monitor, or medication. Since that time, Samuel and Jacob have grown into happy, curious and active toddlers, amazing their medical team and us as well. Miraculously, they are healthy, meeting their milestones, and not on any medications. They love going to the park, bath time, and playing with their brothers and sisters. They bring our family so much joy and we are incredibly grateful to watch them grow up together. 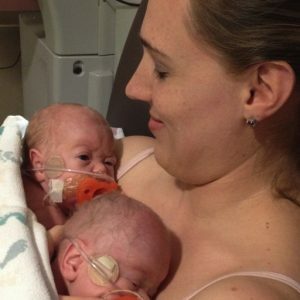 The NICU experience has changed us in many ways. Although it was one of the most difficult times our family has faced, we have certainly grown as a result. We’ve learned to enjoy the moment we have with our children and not waste precious time and energy worrying about “what ifs”. We have a renewed appreciation for the time we have together as a family, and try to be very intentional about expressing our love for each other. Additionally, we have learned that parents know their children better than anyone. Don’t hesitate to ask questions of the medical team, and follow up until your concerns have been addressed. You should never be afraid to trust your instincts and advocate for your baby(ies) in the NICU and beyond. Loving and supportive parents play a huge role in helping their preemie grow and thrive. What a heartwarming, miraculous, and wonderful story! Thank you, Lundgrens! God bless Jacob, Samuel, and all of you!